This is the card I have made for my Mother in Law as today is Mother’s Day in the UK. I was a bit close to the wire as I finished it this morning ! 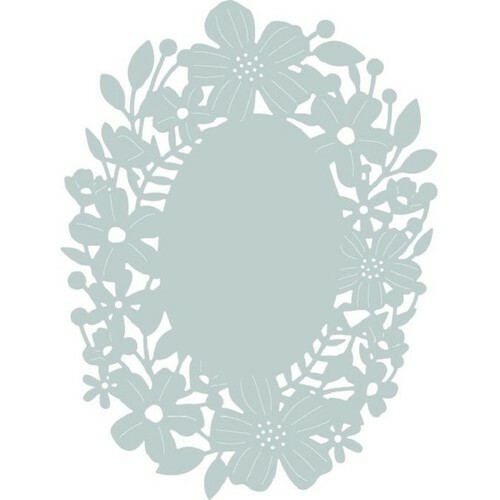 I started with a Sizzix Framelits die cut Blossom Frames. This is what it looks like when you have cut it. I bought it in the sale on the Sizzix site as I thought would look pretty if it was layered and decorated with a bit of bling. I cut it from strong card and used my Promarkers and Flexmarkers to colour them in. If I am being honest I totally underestimated how long it would take to colour and create the different layers. I added Stickles glue to some flowers, gems, pears and the big flower centres are from a decorative trim that was in the bridal section of the Range. The sentiment is Female Occasions Sizzix Thinlits die set. The leaves are from a Funky Floral #2 set and the butterfly is a 3 part die from the Die and stamp combo Let’s Celebrate. I love how ornate it is and it cut perfectly. 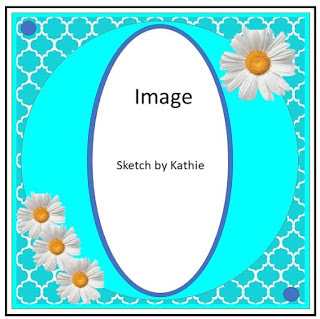 The card layout was inspired by the current sketch at Sweet Sketch Wednesday which I rotated to fit the oval frame. 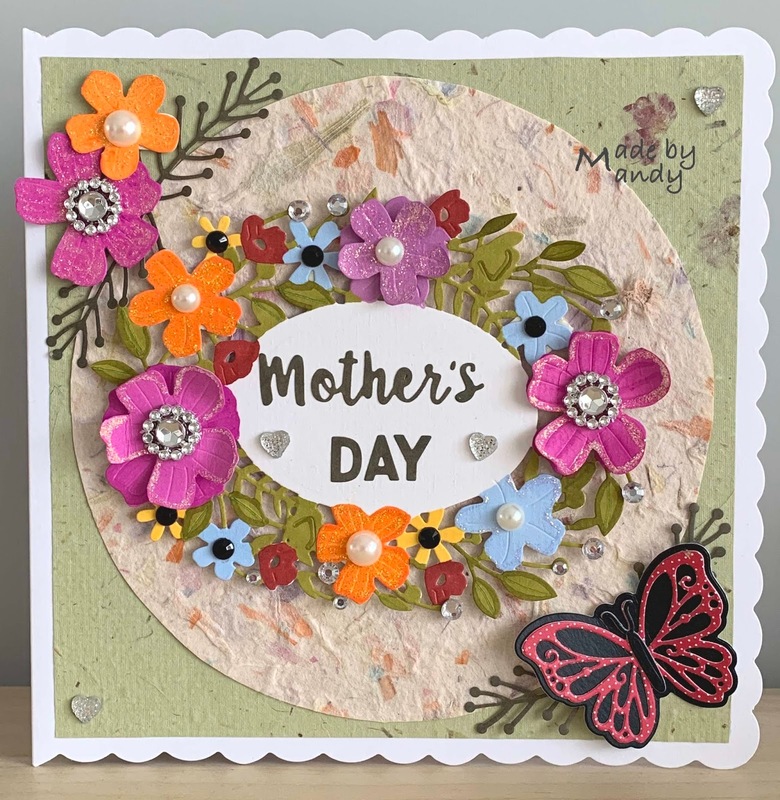 Both the papers are handmade mulberry paper which have got floral inclusions in them which was inspired by a challenge at Outlawz group. I am sure there are many crafters who have had some in our stash for years and not used it for a long while…. Lovely Mother's Day card Mandy. In New Zealand Mother's Day is the first Sunday in May. Love your card what a lovely die you've used and the added bling just sets it off perfectly. Great card and thanks so much for sharing it with us over at Sweet Sketch Wednesday 2 and good luck. Thanks for sharing your fantastic project with us in the Love To Craft Challenge Blog's March "Anything Goes" challenge and we hope to see you again next month! This is a beautiful card and a perfect take on the sketch. Thank you for playing along with us at Sweet Sketch Wednesday 2. Lovely!! Thanks so much for participating in our NOT JUST CARDS challenge. Hope you participate in our next challenge!! Have a happy crafty day!!! A gorgeous card! Thanks for joining us at Cardz for Galz. What a fabulous Mother's Day Card! Thanks for playing along with us at 613 Avenue Create! Lovely card Mandy. Thank you so much for joining us at Scrapper's Delights challenge blog and best of luck with your entry. This is so beautiful and colorful, I love all of the flowers! Thanks so much for joining us about at Cardz for Galz. Beautiful Card & love all the flowers.Thank you for joining us at Scrapper's Delight.